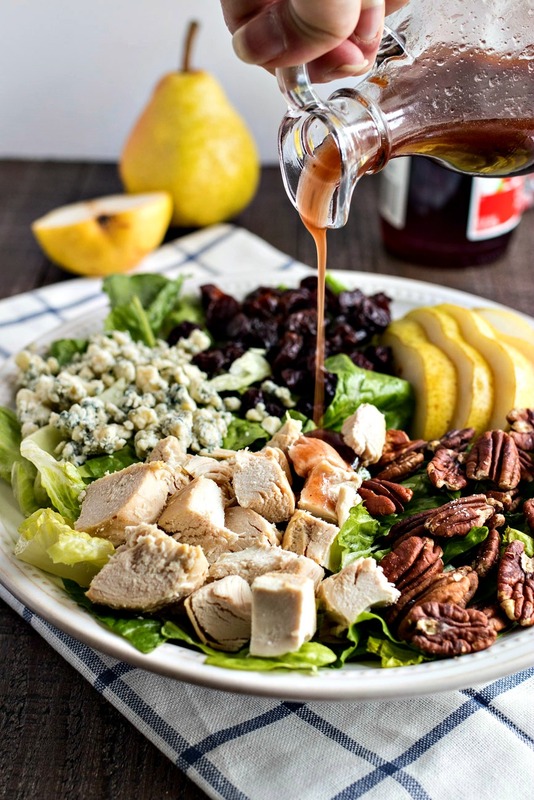 Orchard Harvest Salad (Panera Copycat) – Chopped romaine lettuce tossed with sliced pears, dried cherries, pecans, gorgonzola cheese, diced chicken and homemade cherry balsamic vinaigrette. Copycat recipe of the seasonal Orchard Harvest salad from Panera Bread. I don’t post about salads often because, well honestly, the focus of this blog is usually on the indulgent side of the food spectrum. But I actually love salads. Especially chunky salads full of various flavors and textures that keep you excited about eating it until the last bite. So every once in a while, I like to surprise you guys with a killer salad recipe – not because it’s healthy, but because it’s incredible. The last one I shared with you guys was this Avocado & Charred Corn Salad which was perfect for summer. Now, I have one made for the fall. Today, I share with you my Orchard Harvest Salad with Cherry Balsamic Vinaigrette! This salad is a copycat recipe from my favorite salad from Panera Bread. It used to be on their seasonal menu in the fall, but they no longer offer it. Sad face. When my cravings began to kick-in for this salad, I decided to try to recreate it – including the killer cherry balsamic vinaigrette. And man…I think I got it exactly right! Fresh sliced bartlett pear – so juicy and tender and perfectly in season this time of year. The pear is my favorite part of this salad. I really need to incorporate more pear into my recipes! Oil and vinegar are tough to mix together. You can whisk them but I love to shake them together in a mason jar since (1) it’s so much easier to mix them and (2) I can end up using the jar for storage. If you want a smooth dressing, simply strain the dressing after mixing ingredients together and that will help eliminate the chunks of cherry from the preserves. You only use 1/4 cup of cherry preserves for the dressing so you’ll have a good amount left over. If you need ideas on how to use it, these Glazed Cherry Hand Pies are perfect! You can easily make a half-batch recipe with the leftover preserves. This salad is gonna seriously rock your world. And this is coming from a girl who has high standards for salads, too. Maybe I’ll hit you guys with another recipe after the holidays…Any requests?? Let me know in the comments! Here are all the kitchen tools and serveware that I used in today’s recipe. For each item sold below, I make a small commission. I only recommend items that I own and love so you can trust that each recommendation is tried and true. Thank you for supporting CPA! Chopped romaine lettuce tossed with sliced pears, dried cherries, pecans, gorgonzola cheese, diced chicken and homemade cherry balsamic vinaigrette. Copycat recipe of the seasonal Orchard Harvest salad from Panera Bread. I recommend starting this salad by making the dressing first. Place balsamic vinegar, minced garlic, and sugar in a small saucepan and heat over medium heat. Whisk until sugar has dissolved. Then, continue to cook until vinegar has reduced by half, about 8 minutes. Add cherry preserves to vinegar mixture and cook for 1 more minute. Remove from heat and place into a medium bowl to help it cool down. While it's cooling down, prepare the salad by adding all the salad ingredients (except for the dressing, of course) in a large bowl. Add canola oil, red wine vinegar, salt, and pepper to the cherry mixture and whisk vigorously until the oil and vinegar combine. I strained my dressing to remove the cherry chunks, but that's no necessary if you don't want to. Add a couple tablespoons to salad mixture and toss together. Give the salad a taste and add more dressing, if needed. Serve immediately. Has anyone else made this salad and loved it? I want to make it, but I am afraid I am going to buy all of the ingredients and not like it. I love this salad at Panera, so if it really is a copy cat it would be worth making! As an avid lover of the version at Panera, I think it’s pretty darn close to the original! This looks like the perfect autumn salad! Thanks for sharing! These are some of my favorite salad ingredients! I can’t wait to try this! Ooo! This has all the sweet and savory that I crave + protein! Love the sweet and savory combo too! I adore the pears in this salad — great idea! And the dressing? Divine! Great recipe! This salad is GORGEOUS and combines all of my favorite things! I can’t wait to try it! This salad looks so delicious and healthy , this is my kind of salad . Thank you for sharing. This salad is beautiful! Perfect for fall! I love this salad at Panera! I will have to try your copy cat recipe! Looks so yummy! Not a big gorgonzola fan but other than that this looks amazing!! Going to try with goat cheese. This salad looks so hearty and full of flavor! I just want to stick a fork in and take a big ole bite! Right?! So glad you like it! This salad looks so pretty and delicious! Especially the homemade cherry vinegrette. Aw thank you! Love that vinaigrette too! This salad looks and sounds amazing, all the flavors I love! I have not had it at Panara, but now there is no need to. Thanks for the recipe.